Using VMware PowerCLI scripts with VMware Site Recovery Manager can help you create a more robust, customized recovery plan. We show you how. Manager (SRM) recovery plan. This quick tip is taken from my soon-to-be-released book on VMware SRM 4.0. Although you can use classic style batch (.bat) files to carry out command steps in SRM, Microsoft.bat files are not an especially powerful advanced programming interface (API) for manipulating and modifying the vSphere platform. If you want to make more subtle scripts we really need a more robust scripting engine. Fortunately, VMware has for some time embraced the Microsoft PowerShell environment, supplementing it with cmdlets that are specific to managing the VMware virtual environment. Begin by downloading and installing Microsoft PowerShell to the SRM server at the recovery site, then download and install the VMware PowerCLI tools. Once you have the PowerCLI environment set up inside the recovery site SRM server, you can start to create .PS scripts. It's worth opening PowerCLI to configure your security settings, and to confirm that you can log in with PowerCLI to the vCenter at the recovery site. One of the common questions asked on the SRM forums is how to reduce the amount of RAM used by the VMs during the recovery process. This is a common issue because people sometimes have less powerful ESX hosts in the recovery site. They might have less physical memory than the production ESX hosts in the protected site, for example. Using PowerCLI, we can automate the process of reducing a virtual machine's (VM's) RAM allocation by running .PS scripts before the power-on event. Of course a .PS script for each and every VM would be very administratively intensive, so you might prefer to search for VMs based on their names and make changes that affect many VMs simultaneously. For example, in the .PS script below, the get-vm cmdlet is used to find every VM which starts with the text "ctx" and then "pipelines" this to the set-vm command. This would modify the memory allocation of my VMs ctx01, ctx02 and so on. A more sophisticated script would not set a flat amount of memory, but instead check the amount of memory assigned to the VM and then reduce it by a certain factor. For example, perhaps I wanted to reduce the amount of memory assigned to all the recovered VMs by a factor of a half. The script below finds the current amount of memory assigned to the VM, and then reduces it by 50%. For each VM found with the ctx* string in its name it finds the amount of memory assigned and then uses the set-vm cmdlet to set it correctly. The next part is getting these PS files to be called by SRM. I prefer not to call the .PS script directly but instead I create a .cmd/.bat file, which will call the script at the appropriate time. This helps reduce the amount of text held within the command script step. By using variables in the .cmd/.bat file we can reuse it to call any number of .PS files held on the SRM Server. I first came across the redirect.bat whilst reading Carter Shaklin's PowerCLI blog which discussed using .PS scripts with vCenter Alarms. With help from Virtu-AL's website, I was able to come up with a .bat file that would call my .PS1 scripts. The script loads up the Microsoft Powershell environment, together with the PowerShell console file (.psc1), which allows VMware's PowerCLI to function. The variable at the end (%1) allows for any .PS1 file to be called with a single redirect.bat file. The next stage is to copy your redirect.bat and .PS file(s) to location on the Recovery SRM server. It doesn't really matter where you place them, as long as you type the path to the script correctly when you add a command to the recovery plan, it should execute without an error. In this case, ctx01-ram.ps1, ctx-bulk-ram.ps1 and ctx-ram-half.ps1 represent each of the different examples discussed previously. 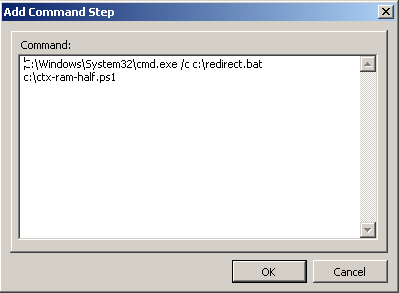 Type the full path to the command interpreter (cmd.exe) the redirect.bat file and the .PS file you would like to execute. The location of the .PS script is important. It must be called before the recovery of the high, normal or low VMs. If not, the .PS script will make changes to the placeholder .vmx files rather than the genuine VM .vmx files. Remember, during the "Prepare Storage" stage, the placeholder .vmx files are unregistered from vCenter, and the genuine VM .vmx files take their place. Therefore any changes made to a placeholder.vmx file will simply be ignored and replaced. You may feel uncomfortable with SRM running these scripts automatically. Another options is to put message steps in the recovery plan and run these commands manually. As you can see, when coupled with VMware SRM PowerCLI can offer all manner of customizations to apply to your VMs and your vSphere4 platform when your recovery plans execute. And it doesn't stop there. In PowerCLI Update 1 a new cmdlet exists called invoke-vmscript. This allows you to call PowerShell and other scripts from within the guest OS of the recovered VMs. But that's the subject of the next tip!